Price reduction on Serenissima rules for Renaissance. By making the Scenario running example available as a PDF download, we are able to reduce costs. So the rule set is now £12.50 (previously £15). Rod is selling some of his reference books, covering many subjects and periods. The following lists have now been compiled, with more to follow. AIRCRAFT - comprising WW1, WW2 and General Aviation History. Dr Kerry Jang of Vancouver, Canada, has sent us photos of his finished model, as well as some of the work in progress. Thanks for the numerous requests for a list of vessels at this battle and the corresponding hull references from our Scale 1:1200 series. If you click on the the bold heading to this paragraph, it will take you to that information. Separate Playsheets including Ability Chart, Speed and Gunnery Charts. Also, Card Compass, Attitude to Wind Indicators, Firing Arc Indicator etc . 6 x six-sided Coloured Dice. What's new about Fourth Edition? It being the 200th anniversary of the Battle of Trafalgar, I was inspired to produce - not just an update of previous editions, but an enhanced game, smoother, with more fluid movement and ability for vessels. The Ability Chart remains fundamental to the game - particularly as it cuts down on the need for excessive dice throwing and record keeping. This time however, there are more dice and they play critical roles. In the past, if you had a 'bad throw', all your actions were affected by that same dice score. With Fourth Edition, the dice are colour coded, with one being 'common' to all. The score of the Common dice is added to the dice relating to the various actions. Other new innovations include the division of a player's part of Turn into two segments and Reloading of the guns, so that the time scale of actions are more realistic. The actual Firing rules are not changed noticeably but there are new separate charts for firing at Unrated vessels. Finally, the format has changed and Carol has done a brilliant job on the layout which makes the rules much easier to navigate. The main rule book takes you through setting up a game and the core game. There are distinct pointers to where a section has an advanced play option and many of the pages have a little 'Quick Ref' box which picks up the actions mentioned on that page and gives you the cross reference page number. 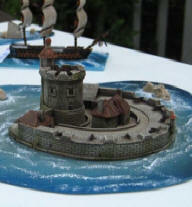 Check out the SCA pages in our Napoleonic Naval section for Q&A and Feedback. Thanks to players in France, particularly Olivier Dufour for writing in 'after action reports' describing their club games - scenarios, action during the game and results. TUMBLING DICE NOW STOCK LANGTON MINIATURES! Paul Sulley of Tumbling Dice are taking Langton Miniatures to the shows! Fort Chapus, also known as Fort Louvois, was built in 1691 to protect the port of Rochefort. The fortification was constructed on an islet off the coast of France. The model is suitable for 18th & 19th century dioramas and wargaming. (RESIN ) Fort complex incorporating gun platform; castle; officers' accommodation; lighthouse tower. (METAL) Flag pole, 8 large calibre cannons, 6 smaller guns, sentry post, steps, entry way. The boxed kit includes a diagram of the fort layout and side elevation. Fast vessel used for trade and to control piracy. Kit comprises metal hull and fittings and brass photo etch sails. 'NAUMACHIAE' - ANCIENT NAVAL WARGAME RULES - . Printed copies are no longer available. You can download it in pdf format (no charge) from this site, but please be aware that the main rule book is a very large file. Go to the Naumachiae page for the links. in Scale 1:1200. 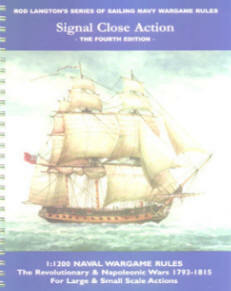 A booklet by Langton Miniatures. Follow links for more detailed info. International Availability: Our products are available in a number of countries, check this link for details. Napoleonic 1:300 scale Models by John Westwood. Photos. Thanks Larry, for the wonderful photos of the different stages of construction of our Napoleonic Naval 1:300 scale models. Also, for your photos of models from the new Great Lakes Series.